The American Iron and Steel Institute (AISI) has published Supplement No. 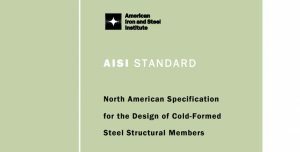 1 to AISI S100-16, North American Specification for the Design of Cold-Formed Steel Structural Members, 2016 Edition. The North American Specification harmonizes cold-formed steel design technology across the United States, Canada and Mexico, allowing for faster introduction of new technologies as well as opening up the market for a variety of derivative products such as design aids and educational materials. Supplement No. 1 clarifies the requirements for strength increase from cold work of forming and for members with holes. It also removes provisions for power-actuated fasteners (PAFs) in concrete to avoid potentially unconservative designs or unintended interpretation of the validity of the provisions in different applications. The 2016 edition of the North American Specification is the most recent version available. AISI S100-16 with Supplement No. 1 is available for adoption in the 2021 edition International Code Council (ICC) model codes. Supplement No. 1 can be downloaded free of charge at as: 1) a stand-alone document, or 2) incorporated into the 2016 edition of the North American Specification.